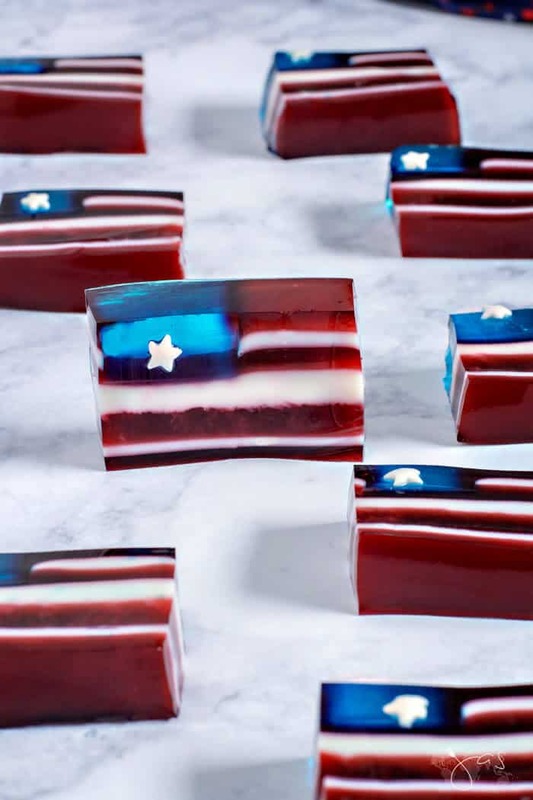 These cute little red white and blue jello flags are show-stopping treats perfect for Independence Day or any patriotic celebration. Don’t they just make you proud to be an American? 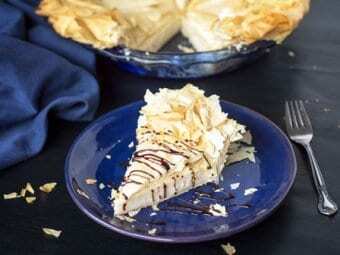 With this dessert, you’ll be the star of your Fourth of July party! With only a few ingredients you’ll have a dessert that your guest will talk about long after the celebration is over. 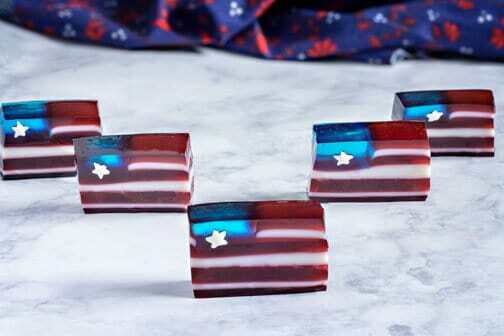 You might want to block some time out for the making of these red white and blue jello flags. Although not difficult to make it does take time for each jello layer to set. I wasn’t patient and you can probably see that thick bottom layer is not clear and they’re not all the same thickness. Another reason for uneven layers is my pan. I didn’t want the full batch as in this 4th of July and flag jello recipe I got the idea from. First, that’s a lot of jello flags and second, a little confession, I don’t like jello. I really try to like it but I can’t get over its jiggly texture. Gag. Can’t do it. So I made this milk pie for myself although that flag isn’t as impressive. Anyhow, moving on and back to my uneven layers. I should’ve used a glass pan so that I can see how much of each color I’m adding, but I didn’t like its very rounded corners. To make a long story short, I used my square metal 9×9-inch pan and thus “blindly” layered the whole thing. However, nobody noticed any imperfections because they were all so impressed with little edible flags. So I stressed for nothing. Strawberry jello is lighter in color and maybe a better option than cherry (which I used). If you’re using a metal pan, don’t forget to mark in which direction your blue stripes go. Garnish a serving tray with red white and blue sprinkles. Prepare a 9×9-inch glass baking pan by spraying lightly with cooking spray. With a paper towel, wipe spray until only a very light layer remains. This will help the gelatin release later. BLUE LAYER: Mix packages of blue jello with 1 envelope of gelatin. Add 2 cups of boiling water and stir until gelatin is completely dissolved. 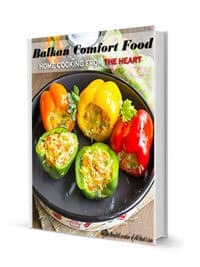 Pour into prepared pan and set in refrigerator about 40 minutes, until gelatin is set to the touch. When gelatin is set to the touch, cut 1-inch strips with a hot knife. Dip knife in hot water after each cut. You can use a large ruler to measure the strips or just eyeball it. Remove every other strip and discard them. Mark a side of your metal pan (not necessary if using a glass pan) with an arrow in the direction of the stripes. The final cut will be in the opposite direction (which you won’t be able to see if using a metal pan). RED GELATIN: Mix packages of red gelatin with 1 packet of gelatin. Add 3 cups boiling water and stir until gelatin is completely dissolved. Add 2 tablespoons of red gelatin to each of the empty spaces. Return to fridge for 15-20 minutes, or until red gelatin is set. Keep the bowl with remainder of red gelatin in a sink with hot water to keep it liquefied. WHITE GELATIN: Combine 2 packets of gelatin with 1/4 cup cold water. Let sit 2-3 minutes. Add 1 cup boiling water and stir to completely dissolve gelatin. In another bowl, mix 1/2 cup boiling water with the cup of sweetened condensed milk. Add milk mixture to gelatin mixture and stir to combine well. Add 2 tbsp of white gelatin on top of each of the red areas to fill up to the same level as the blue gelatin. Pan of gelatin should all be the same level now. Return to fridge for another 15-20 minutes until set. Keep the bowl with remainder of white gelatin in a sink with hot water to keep it liquefied. Next, add 1 cup red gelatin over the entire pan. Return to refrigerator for another 15-20 minutes. Then add 1 cup white gelatin layer over the entire pan and cool for 15-20 minutes. 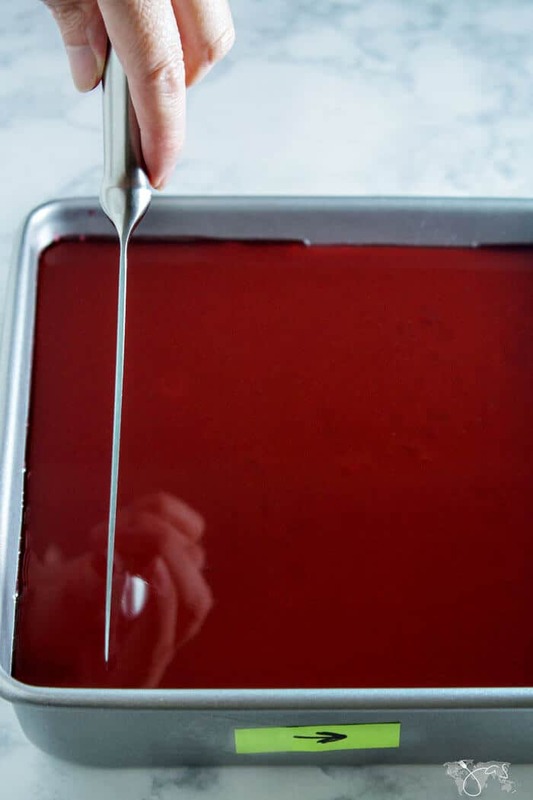 Continue alternating red and white layers until all gelatin is used. Refrigerate the completed pan for at least 2 hours or overnight to set completely. Checking the side of a glass pan, or your mark, to see where the blue gelatin is, cut 1/2-inch strips in the opposite direction. Then cut each strip into small flags. Garnish your red white and blue jello flags or a serving plate as desired. 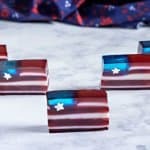 These cute little red white and blue jello flags are show-stopping treats perfect for Fourth of July or any patriotic celebration. Prepare a 9x9-inch glass baking pan by spraying lightly with cooking spray. With a paper towel, wipe spray until only a very light layer remains. This will help the gelatin release later. When gelatin is set to the touch, cut 1-inch strips with a hot knife. Dip knife in hot water after each cut. You can use a large ruler to measure the strips or just eyeball it. Remove every other strip and discard them. Mark a side of your metal pan (not necessary if using a glass pan) with an arrow in the direction of the stripes. The final cut will be in the opposite direction (which you won't be able to see if using a metal pan). ~ Free Tip ~ Strawberry jello is lighter in color and maybe a better option than cherry (which I used). If you're using a metal pan, don't forget to mark in which direction your blue stripes go. Garnish a serving tray with red white and blue sprinkles. See this recipe featured on Simple Nature Decor Blog, Grammy’s Grid, Happily Homegrown, A Pinch of Joy, Jodie Fitz, From Play Dates to Parties, Jenerally Informed, Poinsettia Drive, and Abbotts At Home. These are the absolute cutest thing ever!!! I am not a huge jello fan either, but it seems like one of those these you should do every once in a while. My grandpa would LOVE them and I’m sure little dude would too. You should come shared them at our patriotic party! My granddaughters couldn’t stop eating them. The little one started gagging after a while, just like her grandma, but that didn’t stop her, LOL. Love this, Jas! So creative. these are so pretty but look time consuming to make. 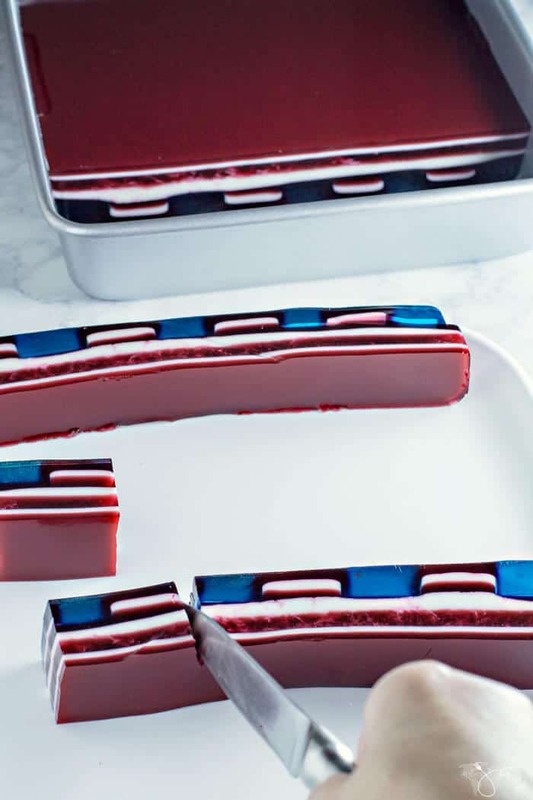 I love jello desserts and this is such a fun way to serve it for July 4th. Pinned. Would love if you came and shared this on Merry Monday. Thanks, Erlene, and thank you for inviting me! I gladly shared my recipe at your party 🙂 Have a great rest of the week. So adorable. Been sharing this recipe everywhere. You are like the coolest, hippest grandma ever to make these! Awww, thanks friend! You’re the bestest! Absolutely THE BOMB!! I adore all things red, white & blue…and have never seen these adorable creations until now. Thanks for sharing progressive photos…I’m so visual. It sure helped me figure it out. Gonna have to try these. So glad you shared at Full Plate Thursday. Hi, Marsha! I’m so glad you like it 😀 I’m visual too, and even though those are not the best progressive photos (it was a dark, rainy day) I thought they could help. Sometimes I give up on a recipe if it sounds too complicated and there are no visuals. Thanks for stopping in and have a happy and safe 4th! I think these look absolutely amazing! You’ve inspired mw to think about a French flag now. I think that will be much easier compared to your masterpiece! Ha, ha it’ll definitely be much easier to make! Have fun and thanks for stopping in! They’re lovely to look at… perhaps to pretty to eat? What a great addition to any party, I will be making this one! Hope you have a great 4th of July weekend and thanks so much for sharing with us at Full Plate Thursday! It’s a fun project although time-consuming 🙂 Happy 4th! Love this, Jas. You’re amazing. Thanks for sharing at To Grandmas House We Go. Pinning. Aw, thank you, Stephanie! Have a great holiday weekend! Just had to share this on FB today. So amazing. Featuring it at our link party Tuesday too. Thanks for sharing! Thank you so much! I wish I posted it a bit earlier though, to better time it with the holiday. I’m always a tad behind, lol. Your jello flag looks amazing, Jas! I love it. What a great way to show off some red, white, and blue! I admire your patience with putting this together! Thanks for sharing at Snickerdoodle. Pinning! Thanks, Beverly! Luckily, my patience is only required a couple of times per year for holidays, lol. These look so effective Jas I’m not sure I would have the patience! Thanks for sharing at #BloggingGrandmothersLinkParty. I’ve pinned and shared. Wish I would have seen this earlier than the day before the 4th! Next year baby! As I said before, absolutely unique!!! Great idea! Thank you Jas for linking up at the #BloggingGrandmothersLinkParty. I shared this post. What a fun and festive treat! I’m pinning now and making this jello dish the next neighborhood get-together. Thanks for sharing at the #ThisIsHowWeRoll Link Party. How clever! I’m with you, Jas, on not caring for jello, but these are so impressive to look at, I’m tempted to give it a try. Besides I’m sure the grandchildren would love them! Thanks for linking up at #BloggingGrandmothersLinkParty. Jas I am seriously impressed with this recipe. It is more like creating a piece of art and not a dessert. Seriously, you should start liking jello after this! At least the grandkids enjoyed it. Hope your Fourth was great!! What a fun, cute dessert for a July 4th party! Thank you for linking up at #BloggingGrandmothersLinkParty. I’m sharing your link on social media. I was on vacation and didn’t get to see this post until it was to late to make these for the 4th. I have pinned it and plan to make them next year because they are so cute! 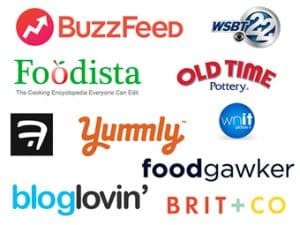 Thank you for sharing at the #BloggingGrandmothersLinkParty! Thank you! I did post them a bit late by bloggers’ standards, ha. Jas, these are amazing!! You are SO talented!! What a fabulous celebratory treat. Pinning and sharing! Oh I just had to laugh; jell-o makes me gag too but my boys LOVE it. This would be fun to make with them. Thanks for sharing. Pinned. Those are just so stinkin’ cute! I’m with you though, Jello isn’t my favorite. But my kids just think it’s the BEST. Thanks so much for sharing at the #happynowlinkup! Glad I’m not the only one. I don’t know what’s the obsession with jello, lol. Whoa!! These look so creative and so cute, Jas!! Such a lovely treat to celebrate 4th of July. I am sure everyone at Fiesta Friday party would love these! Thanks for sharing! Thank you much, Jhuls! They do not photograph well, unfortunately. 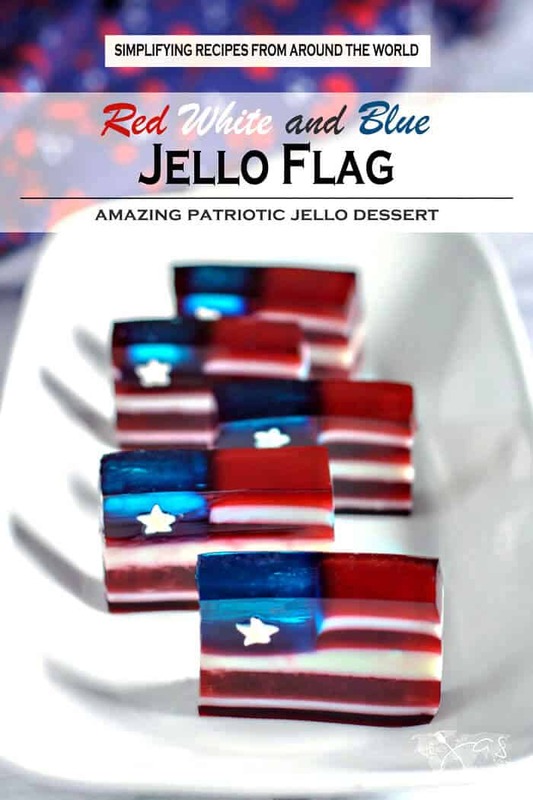 Your Jello Flag, is just perfect for the upcoming holiday! Hope you are having a great week and thanks so much for sharing with us at Full Plate Thursday!